Final hours: Buy 2 get 1 DVDs that are downright scary! 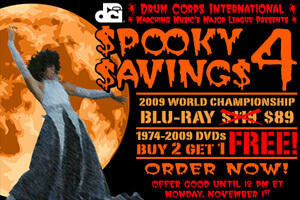 2009 World Championship Blu-ray: was $119, NOW only $89. It's time to put the candy aside for one last Halloween treat that'll make your dentist smile. Visit store.DCI.org to place your order today!